An honest-to-goodness Mini Boglin from the early 1990s! Yes, those rubber monster puppets came in figure form, too! Have fun with your new monster! 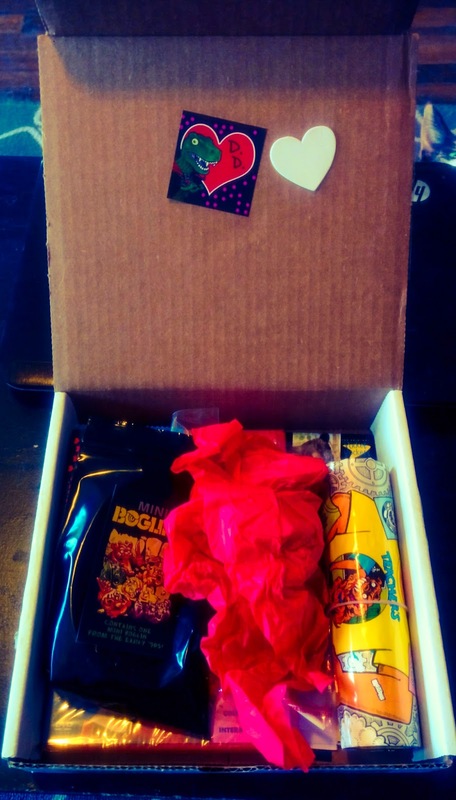 A Valentine's Mordle in custom Dino Drac packaging! These demons will help you be lucky in love! Three horrific card packs, including rarer finds like Jaws 3-D and Monster in my Pocket! A vintage Topps T-Shirt Factory iron-on -- yes, a legit one -- go make yourself a fancy shirt! Dino Drac's February 2015 Ugly Mini-Poster, Valentine's Day edition! Dino Drac's February 2015 Specimen -- a piece of an old Hostess TMNT Pudding Pie wrapper! To me, the Mini Boglin is the cream of this box's crop, for sure. And that Hostes TMNT wrapper brings back so many childhood memories -- I love it! One of these days I promise to either photograph everything in the box, or just record myself opening the box and rummaging through it. I'm lazy, I know. Thanks again to Matt and the awesomeness he provides!